The name of chia seeds is derived from the Aztec word “chian” ” for “oily”, which stands for the high content of omega-3 acids in them. Omega-3 acids are also found in fish oils, flax seeds, and kiwi seeds, and the balance between them omega-6 oil is very important for our health. 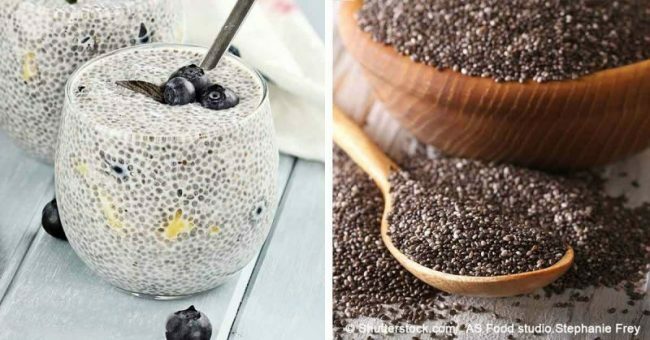 Chia seeds are excellent for our digestion since they are abundant in fiber, and if soaked in water, they create a gel-like solution that moves through the body and cleanses it. Moreover, it prevents the fast breaking down of carbohydrates in the body by decelerating the action of the enzymes on the carbs. The Aztecs loved chia seeds, due to their amazing nutritional value and countless beneficial properties. These seeds are low in calories, but rich in protein, fiber, manganese, phosphorus, and calcium, as well as antioxidants and important micronutrients. Chia seeds also contain magnesium, iron, iodine, niacin, thiamin, several essential fatty acids, as well as vitamin A, vitamin B, vitamin E and vitamin D.
Chia seeds contain 19 amino acids, with all of the essential amino acids except taurine. To reap the benefits of chia seeds, add them to your fruit juices, baking goods, protein bars, smoothies, salads, or any other dish.